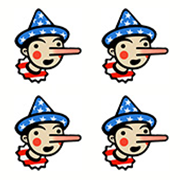 The Fact Checker is used to politicians weaponizing our fact checks, especially when we award Four Pinocchios to their opponents. But we have never seen a politician falsely claim that we gave his opponent Four Pinocchios. Brat especially had no excuse, because we objected to a tweet and a news release issued by his campaign many hours before his debate. On Oct. 15, we dissected an ad from the Democratic Congressional Campaign Committee that relied on minor procedural votes to suggest a Republican, Rep. Brian Fitzpatrick (R-Pa.), had voted to support the GOP plan to repeal and replace Obamacare. In fact, he had voted against the American Health Care Act (AHCA), specifically citing the impact on people with existing health conditions. That ad was worthy of Four Pinocchios. As an aside, we noted that Spanberger had cited one of these procedural votes in an attack ad on Brat. But we offered no rating on her ad. That’s because although the procedural vote was not especially significant, Brat had voted previously to repeal the Affordable Care Act, without any replacement plan, and he had voted for the AHCA. A vote for the AHCA is important in the debate over preexisting conditions. Despite Brat’s claim in the debate that “our bill passed through the House with preexisting conditions and lower prices,” that’s false. As we have documented, the Congressional Budget Office — which assessed the bill only after the vote because Republicans pushed through a bill without waiting for a CBO score — sketched a scenario that described unraveling insurance markets and soaring health-care premiums if the AHCA had become law. The CBO, in its report, said that states that took advantage of waivers offered in the proposed law could perversely end up blowing up their insurance markets, leaving spiraling costs for people with preexisting conditions. About one-sixth of the U.S. population was estimated to live in states that would face this problem. As for “lower prices,” that is also a stretch. Again, we have shown that, based on CBO analysis, average premiums would continue to go up but less than an anticipated baseline. Moreover, while for younger Americans, the increase would have been at a slower rate, premiums would have soared for older Americans. Indeed, one key reason for the lower average premium in 2026, compared with current law, is that older Americans increasingly would have been priced out of the market, resulting in a younger, healthier mix of policyholders. In other words, Brat’s vote for the AHCA — and the potential impact on insurance markets — offered a justification for the Spanberger ad that was missing in the DCCC ad. He also voted to repeal Obamacare without any replacement plan in place, which would have eliminated Obamacare’s protections on preexisting conditions. We could not determine why the Spanberger campaign chose to focus on a procedural vote, but given Brat’s voting record, the overall ad was defensible and did not earn any Pinocchios. Interestingly, the May 4 vote is also cited in an ad for Abigail Spanberger, a Democrat who is challenging Rep. Dave Brat (R) in Virginia’s 7th Congressional District. “I feel betrayed by Dave Brat. He voted against protections for preexisting conditions,” says Virginia resident Jody Cametas, identified as a former Brat voter, as the vote citation appears on the screen. Brat, however, is much more vulnerable on this issue than Fitzpatrick. He repeatedly voted to repeal the ACA without any replacement — when Barack Obama was president and the repeal votes had no consequences. In theory, those votes were to eliminate the protections. (Fitzpatrick entered Congress in 2017, so he missed those repeal votes, though his brother Michael, who held his seat before him, voted to repeal the ACA.) The Spanberger campaign cites 13 votes in which Brat voted to repeal the ACA or undercut other aspects of the law, though many are procedural or on nonbinding budget blueprints. We gave the Brat campaign an opportunity to explain his remarks but did not get a response. Brat is misleading voters in his district with his claim about our fact check — and his statements on preexisting conditions. Once again, the Spanberger ad earned no Pinocchios. But Brat now earns Four. "Her ads, which are running today, she got Four Pinocchios for the lies on my votes on preexisting conditions."